All the time largest benefit of Linux was fact, that graphic environment was split in two levels – x Windows and graphical shield. X windows, also known as xorg, provide connection between computer resources and graphic environment. Xorg by itself does not provide graphic interface. (xterm?). Graphic interface is what user see and uses. Most popular – Gnome, KDE. Graphic shield developers are able pay more attention to graphic details and effects, whereas xorg developers on providing more and more system features to be used. Most amazing, graphic shield developers are free to choose what, where and how items will be located including not so traditional way like 3D desktop. Starting with KDE version 4 (now version 4.4 is available), 3D desktop, or cube effect comes in standard package. This effect can be enabled if systems resources are sufficient (it require OpenGL), by switching it on in system properties and activate using CTRL+F11 keystroke. Windows provided nothing from what is said about Linux. Some changes introduced MS Windows Vista providing alternative Alt-Tab switching (using Win+Tab). Alternative Alt+Tab switching is just an effect and does not give any benefit. Clever gays went feather and created Cube or 3D desktop. Cube desktop can be installed as independent software. For testing, I will use Oracle VM VitualBox and MS Windows XP SP3. In order to provide maximum performance, fresh DirectX was installed as well. Very simple installation, even there was no need to restart system. 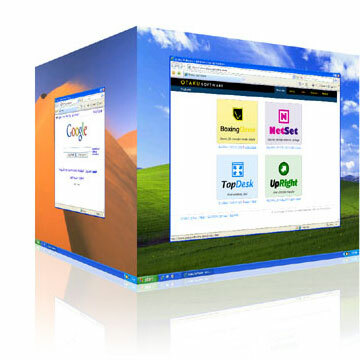 In Windows XP systray appeared 6 new icons indicating 6 virtual desktops. To switch between desktops you can by clicking on these icons or activating cube view and do it by mouse. Short keys also can be used, which can be adjusted if needed. From first sight this software is a little more advances in a numbers of functionalities. On emulated Windows, beautiful animation while switching between desktops as visible in advertising video, was not visible. Instead white cube was shown. Concerning functionality, this software provides also Flip, Cillinder and Carouse 3D effects. Extramly short trial time – only 120 minutes. From first sight very subdued software providing only 4 virtual desktops. Switching between desktops can be done by using mouse or short keys. There exist also other desktop management effects. In some sources is said that this software based on functionality of yodm-3d . Main benefit – software is fully for free. 3D Desktop and touch screen. How fast will 3D desktop become popular depends on many factors, main of them – how usable and convenient will be to work with such desktop. On the first touch, I was unable to feel a significant difference between usage of 3D desktop or switching between tasks in old fashion. Multiple desktops are nothing new. For example, KDE provided 4 virtual desktops since I used it for the first time. Probably 3D desktop would gain its popularity in tandem with touch screen. Even more, I think it is so human to wish to look on the another desktop by looking on the side of monitor.